If you’re considering introducing self-service to your venue, it helps to understand the various options and pros and cons of each. Some styles of self-service will suit certain outlets more than others, and some are just better serving customers the traditional way. It's good to start with a clear idea of why you want to introduce self-service and what you intend to gain from it. Potential benefits are increased footfall, higher spend per head, and improved customer experience. However, these benefits are not guaranteed. Realising them involves selecting the right type of self-service for your venue and correctly accounting for your expected demand. Then you still need to follow the best operating procedures to get the most out of your self-service system (more on this in a future blog post). Get these things right and the benefits can be enormous. Get them wrong and your self-service plans could end up a costly mistake. Self-serve beer is what gets people excited. Customers love the novelty and convenience of pouring their own pint. And will often plan a visit to your venue simply for this reason. There are two main options when installing self-service beer taps in your venue - taps on tables, or a self-service beer wall. Whilst both offer the novelty of pouring your own pint, each provides quite different benefits. Taps on tables offer the customer convenience. There’s no need to leave their table and queue at the bar to get another beer. 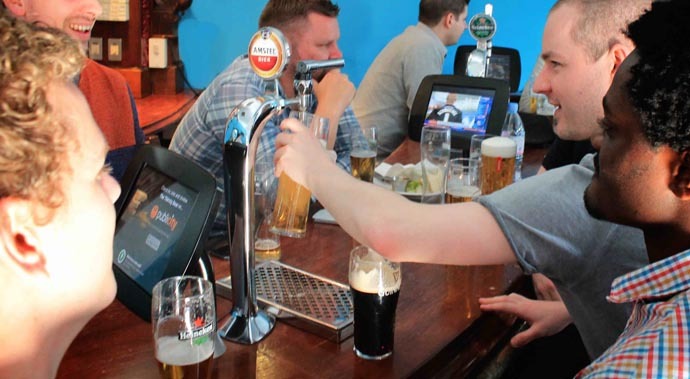 This type of self-service can be a great choice for sports bars where customers will appreciate not having to miss the match or face the dreaded half-time rush to get a beer. It can also work well in any busy bar, where customers want to enjoy the night out with friends rather than spend it queuing at the bar. They would still need to go to the bar for other drinks or to order food, so including iPad menus with taps on tables can be a great overall solution. 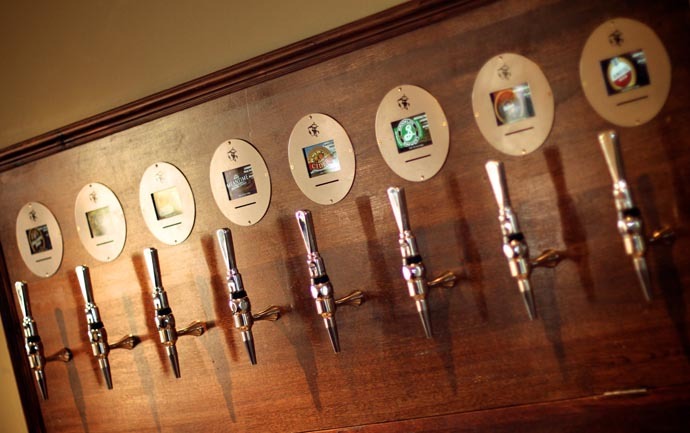 A self-service beer wall offers multiple taps in a central location that any customer in the venue can use. This provides more product choice for the customer, so beer walls can be a great option for venues with a large beer selection, such as craft beer bars. In the right location, the beer wall can also offer convenience. Beer gardens, or areas a long way from the bar can be great locations. If you’re planning to put your beer wall close to the bar you need to give your customers a good reason to use the wall rather than the bar. This may be a different product offering, although in our experience unless the beer wall is the only method of purchasing draught beer, those located near to a bar don’t tend to perform as well. iPad menus are often considered almost as an after-thought to self-serve beer taps. However, we have seen that these can provide some of the greatest benefits in terms of customer experience and sales uplift. With an iPad menu at their table, a customer can order any item of food or drink available, offering the ultimate in convenience. They never need to leave their table to queue at the bar and can spend their entire evening catching up with their friends. Customers order more when ordering is as simple as tapping the screen in front of them. They also stay longer when they don’t have the hassle of queuing at the bar. Adverts on the iPads can display tantalising food images or tempting drinks offers to further increase spend per head. You can even push out time-limited offers that have your customers scrambling to order your highest margin drinks. iPad menus will not suit all venues and could look out of place in some. However, in the right style of venue, they can offer one of the most successful types of self-service. Smartphone menu ordering works in a similar way to iPad menu ordering without you needing to go to the trouble or incur the cost of fixing iPads to your tables. You also don’t need to worry if iPads won’t match the look & feel of your venue. There are of course some drawbacks. Your customers need to download an app onto their phone (though this can provide an incentive for them to do so, which then offers you a new loyalty & marketing channel). Customers’ browsing on their own phones makes for less of a social experience than sharing an iPad for the table. Smaller screen sizes and the fact phones spend most of the night in a pocket or bag, make it harder for you to tempt customers with food imagery, drinks deals or timed offers. As a result, a venue using smartphone ordering is unlikely to achieve the same volume of self-service orders as one using iPad menus. Smartphone ordering can be a great choice where iPad menus wouldn’t be a good fit. It can also be great for beer gardens where iPads wouldn’t be a practical option. Smartphone menu ordering can also be used by hotels or pubs with rooms to provide a modern and convenient room service option. Once customers download an app to order food or drinks, you can use the same app to offer a loyalty scheme and keep them updated with news and events happening at your venue. No one knows your business better than you so this article is only intended as a guide. If you’d like to talk through whether self-service could work in your venue and which type might work best, contact one of our team for a free consultation.